Gregory Porter in concert. What a delightful way to kick start the 2017 TD Toronto Jazz Festival. I had always wanted to catch Gregory Porter live but the opportunity never presented itself. This time I jumped at the chance and was basically on stage to witness this colossus of vocal serenade. Actually I was lower balcony left and this put me just above and in back of pianist Chip Crawford. I had a direct view of the excitement on stage. At this point in Porter’s career, I believe just about everyone on the planet is familiar with his achievements. Achievements that are quite remarkable, winning the Grammy for best jazz vocal album 2014 for Liquid Spirit and in 2017 for Take Me To The Alley. Other albums of note, Water the Porter 2010 debut, which just happened to be nominated for a Grammy and the follow up in 2012, Be Good. 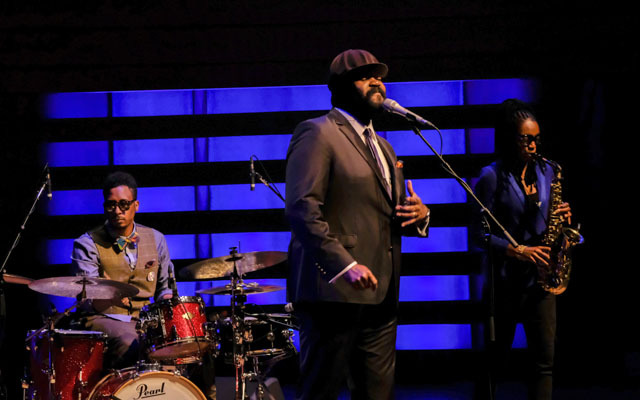 A warm reception from the audience, a packed house, Koerner Hall had been sold out for months in advance of Gregory Porter’s performance. Opening with “On My Way To Harlem” the bands sound seemed off, but it was quickly sorted out during this song. Songs from the 2017 recording Take Me To The Alley were played and the title track was performed with great spirit. It was the second song in and the audience seemed hooked. Porter exudes cool on stage. If a voice and a look can correspond, then Gregory Porter has the look and sound of deep baritone cool. His stage presence is powerful, just like his look and his incredible voice. For this evening’s Royal Conservatory, Koerner Hall performance Porter is looking dapper, in a three piece suit, gliding over the stage in black polished shoes. He sports an eye catching Kangol Tropic Spitfire hat and striking open faced balaclava, this is the Porter signature look. The dynamics and spirited performance of Gregory Porter was profound and seemed to spur on others in the band as well as the audience. Particularly bassist Jahmal Nicholls whose playing was on fire. His bass playing was solid and in the groove all night long and he seemed to be having a blast. For this evening’s performance Lakecia Benjamin was blowing on the alto saxophone and she had her soft shoe shuffle going from the get go. She was literally dancing and shuffling to some of the up tempo rhythms. Her playing was exciting, on each break she really let rip, playing with equal amounts of soul, funk and jazz. Lakecia Benjamin, a name I will remember and be looking out for. The drummer Emanuel Harrold seemed to be playing in his own groove and I found it to be disjointed. At one point in the performance he was abandoned on stage. It was near the end of the show, he started soloing and got into a groove that got the audience clapping, a moderate quarter note beat. He was content to stay in the audiences groove and as if drumming to a click track, he put on a seminar on how to play every which way around that clicking, clapping meter. Harrold is an accomplished drummer with his own distinct style, he seems to hear the rhythms and melodies from a different perspective and plays in a polyrhythmic manner. He is however an integral part of the Gregory Porter sound. A solo by bassist Jahmal Nicholls during “Papa Was A Rolling Stone” and “Musical Genocide” was much more fitting. The group stuck around lending support and encouraging Nicholls to dig deep. He was slapping the bass and plucking the strings, rocking heavily, he even quoted “Smoke On The Water” the audience was pulled in with ease. The pianist Chip Crawford holds it all together, musically and figuratively, he seems to be the connection between the singer and the songs. Crawford is credited on recordings as the musical director and as such he is responsible for the music and the rhythm section. The connection between Porter and Crawford came through quite clearly during their musical duet. The other band members departed the stage, Gregory sat down and spoke to the audience. Discussing breakfast places, sidewalk cafes and Toronto’s small town vibe. He mentioned a couple of his musical idols, Nat King Cole and Frank Sinatra and how he is working on a new album featuring the music of Cole. He gave the audience a taste, “Moon River” followed by “Mona Lisa” The full band came back for a Porter song, “Consequence of Love”. Other songs that Gregory Porter graced the audience with included, “Liquid Spirit”, “In Fashion”, “Hey Laura” and “When love Was King”, all great tunes sung with passion and conviction. Gregory Porter is an incredible jazz singer with a voice and a style of distinction and originality.